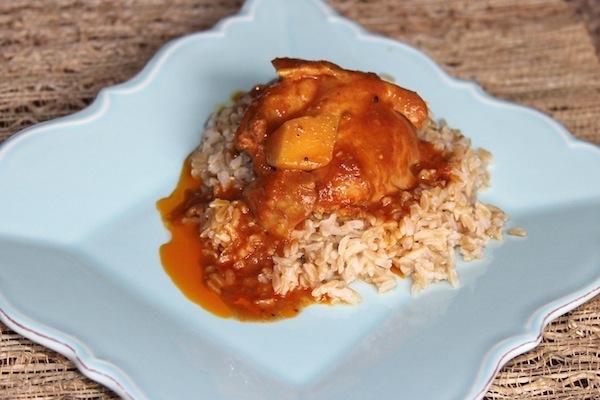 This is a very family friendly slow cooker recipe that has some serious flavor depth. This recipe is a nice base and you can tweak it according to your preferences or what is on hand. Some will prefer a little heat, so add chili peppers. Others will prefer more veggies – add cauliflower, eggplant and /or sweet peppers. As a time saving technique simply mix the sauce the night before, prep your sweet potato and onion and then in the morning all you have to do is add the chicken and prepped ingredients to the slow cooker. The flavorful spices add some great depth to this slow cooked dish. When you decrease the fat in a dish, extra flavor from flavorful herbs and spices really helps. Brown rice is a whole grain that provides fiber, magnesium and minerals. In a 5-6 quart slow cooker, whisk the paste, coconut milk, garlic, fresh ginger, red wine vinegar and spices. Add the cubed sweet potato and place the chicken thighs on top. Sprinkle the onion slices over if using as well as any other vegetables you choose. Twenty to thirty minutes prior to serving, prepare rice. Serve on top of brown rice or wheat bulgur. Garnish with chopped cilantro and enjoy!